I am constantly asked about gluten free products and over the past few years, we have created more and more items to help our clients and their children with their diets. Whether they are Celiac, gluten intolerant or just feel better by omitting or limiting gluten from their diets, I think it is so important to diversify your whole grains! We use brown rice and quinoa a lot. Black rice has amazing nutritional properties too! 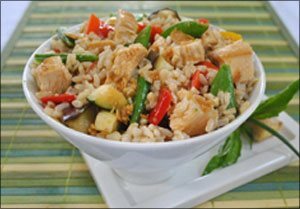 I love to mix quinoa and rice together, it give such a different and interesting texture. 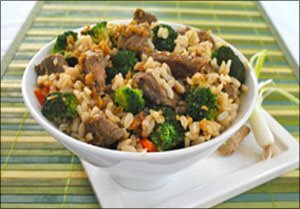 So try mixing it up with these rice bowls! The veggies can be mixed up as well based on seasonality. The key is the yummy sauce and making sure you find a Gluten Free and LOW sodium soy sauce. Easy enough to omit the meat and make these 100% veggie also! Or try topping with some grilled shrimp! Mix all ingredients until sugar dissolved. 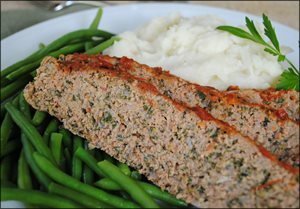 I have never been a fan of meatloaf. I don’t eat beef and generally the word “loaf” turns me off. But this recipe is AMAZING and has always sold very well for us. Moist and delicious! Great to entertain with or simply for your family. Freezes well too! Cauliflower mashed potatoes are so popular and I LOVE them, if you have not tried them yet, give them a try! This recipe could not be simpler! No butter added (although you can add a little or add roasted garlic to give them an added boost!) Cauliflower adds so many nutrients and lowers the calories. Mix all ingredients together. Gently press ingredients into 8″ square Pyrex glass or metal baking pan. *Serve with your favorite marinara or use Green Plate Kitchen tomato sauce on the side. Puree all ingredients and serve hot! Happy and Healthy Cooking! Let me know your feedback if you try the recipes or have comments.